Well, I finally did it, I finally start a food blog! This is something I've been wanting to do for at least a year now, but never worked up the motivation to actually start. Any time my friends suggested it to me, I'd quickly list off all the same excuses I'd been giving to myself: I don't have the time, my photos aren't good enough, I don't want cooking to become a chore just to give me blog material, I don't have anything interesting to add to the hundreds of food blogs already out there, and most importantly, I don't even know how to start a blog. Yet at the same time, I was always dreaming of what my blog would look like, what I would call it, what recipes I would post, etc. I don't know what finally changed my mind, but one day I decided to just start researching this blog thing - how hard could it really be? Turns out it is ridiculously easy (as long as you don't get into all the weird html code stuff, which I am staying far away from), and within about 30 seconds you could have your own blog up and running on Blogger. I started playing around with the template, and pretty soon I realized I wanted to give this a real try. I had already come up with responses to all my previous excuses: I'm already taking the time to cook and photograph my food, so posting them online will be the least time consuming part of the process, if I start a blog then I will be forced to improve my photography and cooking, it would give me a fun hobby to help me avoid schoolwork, and it would be the best way to share my favourite recipes with family and friends. So, after a minor debate between the go-getter and the procrastinator sides of myself, the latter lost (which rarely happens), and this blog was born. For my first post, I thought I'd choose a recipe that is simple, fast, healthy, and summery, and this pasta fits the bill perfectly. Even though there are a few different components to assemble, it doesn't take much time at all, and the end result is summer in a bowl (or plate, depending on how you like to serve your pasta). 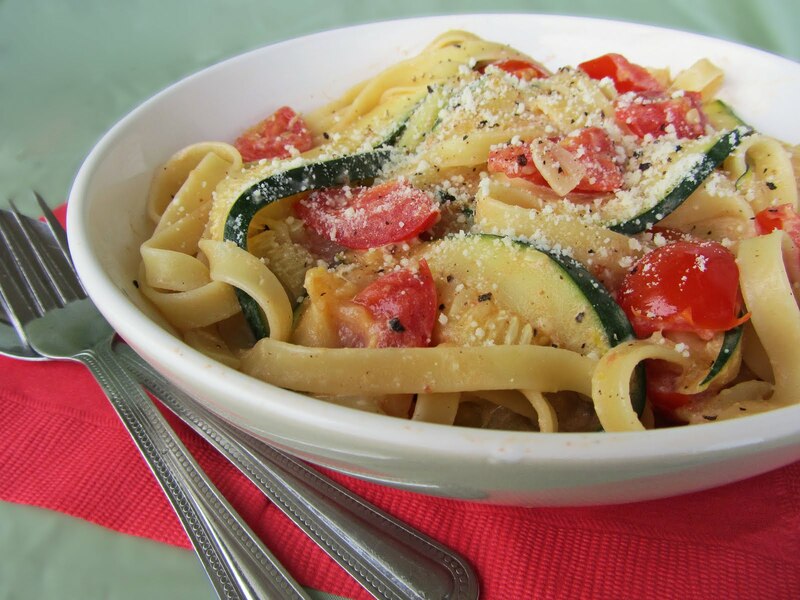 Zucchinis and tomatoes are all over the farmers markets lately, and this dish is a great way to highlight them. The star, however, is the tangy lemon yogurt sauce - I'm not ashamed to admit that I licked my bowl clean afterwards. Prepare the tomatoes, garlic, and zucchini. To prepare the zucchini, slice into thin strips, about 3 inches long and ½ inch wide. I found it easiest to slice the zucchini in half down the middle first, then slice each half lengthwise into very thin strips, then slice each strip in half lengthwise. In a large bowl, stir together the yogurt, parmesan cheese, lemon zest, salt, and pepper. Set aside. Cook the pasta in a large pot of boiling water, according to package directions. Drain the pasta, reserving about ¼ cup of the cooking water. Heat the olive oil over medium-high heat in a large skillet. Add the zucchini and cook until just wilted and somewhat see-through, gently stirring occasionally. Push the zucchini aside to clear a spot on the bottom of the pan and add the garlic. Cook for 15 to 30 seconds, until just golden. Mix in with the zucchini. Stir in the tomatoes and cook until softened, about 2 minutes. Transfer both the zucchini mixture and the pasta to the bowl with the yogurt sauce, and toss gently until completely coated. If necessary, add the reserved pasta water a tablespoon at a time to thin the sauce. Divide among four bowls to serve, and sprinkle the top with parmesan, and extra salt and pepper if desired.